The term system refers to a group of parts or components that interact and that are dependent upon one another to form a more complex whole. Researchers have adopted micro or macro approaches to investigating systems. Biological scientists, when looking at living organisms, have traditionally focused upon the individual components of the organism. Not infrequently, they have intensively studied and gathered as much information as possible, sometimes over a lifetime, on a specific enzyme system, brain part, or photosynthetic pigment. This has been referred to as a reductionist approach to scientific research: all the information gathered on individual components is used to formulate a complete description of the system, referred to as the “bottom-up” approach. In 1968, the Austrian-born biologist Ludwig von Bertalanffy proposed turning over the reductionist model 180 degrees and using a “top-down” approach, which he referred to as a general system theory. The basic elements of this theory are applicable to problems in many disciplines, including engineering, the social sciences, and biology. Rather than adopting the reductionist approach of studying individual components in isolation, in systems biology researchers look at organisms as an integrated network of genes, proteins, biochemical reactions, and physiological responses that give rise to life. In systems biology, researchers approach all components and interactions among those components as parts of a single system, with the interactions responsible for the form and function of the entire system. Thus, the whole is viewed to be greater than the sum of its parts. Few individual biologists can fully understand a complex biological system by exclusively using their specialized and relatively circumscribed backgrounds to study individual components parts. Bertalanffy envisioned systems biology as an integrated multidisciplinary study that called upon the expertise of biologists, physicists, computer scientists, mathematicians, and engineers. Such a systems approach might, for example, be applied to construct mathematical models that predict the consequences of climatic changes resulting from a reduction in rainfall on plant life, which affects crop supply and, in turn, food supply for human consumption. SEE ALSO: Homeostasis (1854), Ecological Interactions (1859), Coevolution (1873), Biosphere (1875), Global Warming (1896), Endosymbiont Theory (1967), Depletion of the Ozone Layer (1987). The study of the universe utilizes a systems approach, allowing astrophysicists to predict cosmic events billions of years before their actual occurrence. 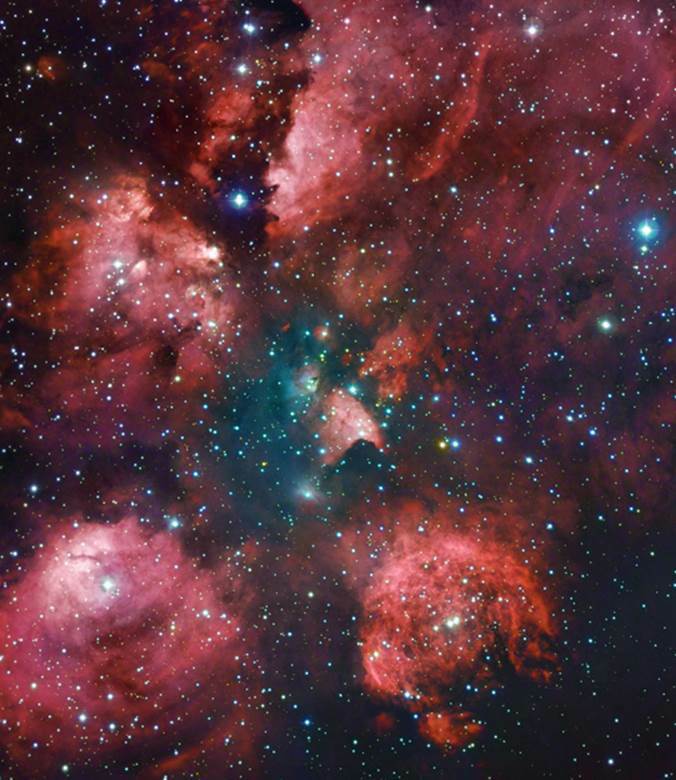 The Cat’s Paw Nebula, shown in this photograph made from a combination of exposures, lies in the constellation of Scorpius (The Scorpion), close to the center of the Milky Way—relatively near to Earth at a distance of 5,500 light years.